In his essay “Jazz and Male Blackness”, scholar and musician Joao H. Costa Vargas describes the jam sessions held at the World Stage, a storefront workshop and performance space held at Leimart Park in South Central Los Angeles. The workshop was founded in the early 1990s by legendary jazz drummer Billy Higgins and spoken word poet Kamau Daaood. In the essay Costa Vargas examines the myriad ways that concepts of black masculinity are rendered, maintained, protected and re-imagined, all in the context of the artistic culture that the workshop facilitates. 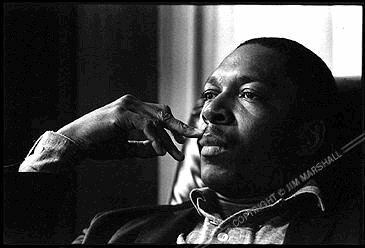 That John Coltrane would serve as a centerpiece at the World Stage and like-minded artistic collectives is not surprising, as Coltrane has been lionized by Black Arts communities as few others have been. Recalling Gil Scott Heron’s “Lady Day and John Coltrane” (“until our hero rides in, rides in, on his saxophone”) or Chuck D’s assertion that critics treat him like “Coltrane/insane” the saxophonist has, in some sectors, been elevated to superhero status alongside male contemporaries like El Hajj Malik El Shabazz (Malcolm X) and Huey Newton. Yet the high regard that Coltrane is held is somewhat ironic, given that few, except die-hard fans, know much about the saxophonist’s personal life. Whereas figures like Malcolm X, Huey Newton and even jazz peers like Miles Davis, Louis Armstrong and Duke Ellington were highly visible and celebrities in their own right, Coltrane’s existed on a much lower public register. Coltrane’s transcendent stature instead has much to do with many of the iconic photographs taken of him in later years (Coltrane was only 40 when he died in 1967), where his image became a literal metaphor for artistic and spiritual integrity. And then of course there was the music, especially signature mid-1960s recordings like “Alabama” and A Love Supreme in which Coltrane seemed to draw directly from the traumatic realities of Black America. Indeed the photographs of and music from Coltrane are so evocative of the 1960s—and the attendant struggles for Civil Rights, the articulations of Black Power and the embrace of Non-Western religions—that many take for granted the genius of his performance in those later years, so much so that A Love Supreme’s “Acknowledgement” seems cliché. Though many have described Coltrane’s music late in his career as inaccessible, Coltrane was grappling with ways to push beyond the limits of his instrument(s). Every one of the blurts, honks and screams that Coltrane summoned on his way to an aesthetic of free-floating improvisation, was an attempt to bring into the world a tangible representation of the spirituality that his instrument(s) were fundamentally incapable of articulating. As such scholar Aaronette White could persuasively argue 35 years after Coltrane death, that Coltrane’s model of improvisation can be used as an example for the “improvisational lives of profeminist men”—the bringing into the world, a concept that many would have thought impossible. While Miles Davis’s move to plug into the Wah-Wah pad in the early 1970s was rooted in his own desire to hear something different, Coltrane’s genius is that the source of his own seeking was his spiritual self. Davis freely admitted that he plugged in to make his music more attractive to black youth, then entranced by the music of Sly & the Family Stone, The Jackson 5 and to a lesser extent Jimi Hendrix—and to reap the financial benefits of such an arrangement. Coltrane, on the other had had little problem alienating mainstream jazz fans and even members of his own quartet, like McCoy Tyner and Elvin Jones, in his efforts to find some semblance of spiritual transcendence. Many collective fans threw up their hands, though two generations later Coltrane remains the ultimate emblem of artistic integrity. No one is mistaking Lil’ Wayne for John Coltrane. Debate if you must the merits of Wayne’s own claims about hip-hop supremacy, but the reality is that no one on this earth sounds like Weezy. And perhaps that is the point. Two generations ago, Lil Wayne would have been the most popular rhythm and blues (not R&B) singer on the chitlin’ circuit, likely making us forget who Bobby “Blue” Bland and Johnnie Taylor were. Many of us expend remarkable (and unremarkable) energy denoting the lyrical atrocities of everybody’s favorite commercial rapper (and I stand accused), very few admit that some of these cats matter simply because of the sound of their voice—and in that regard Lil Wayne is peerless. As such the markings on Wayne’s body, like the slurs, blurs, bleeps and blushes of his vocals, index some variety of trauma, that quite frankly, existed well before Hurricane Katrina. Though his comments elicited some laughter, Cornel West observed as much when he suggested during CNN’s Black in America roundtable that Wayne’s physicality bore witness to catastrophic events. Has there ever been a rap figure who very body articulated such a depth of vulnerability? Unlike historical figures like Doug E. Fresh and Biz Markie who used their voices to create new sounds, Lil Wayne, like Coltrane is really using his voice to find alternative registers for what has clearly been a life lived in absurdity and pain—even if some of it might have been self inflicted--and perhaps it is as it should be, as Lil Wayne’s urges us to come to terms with the first edge of the Post-Katrina Blues. Mark Anthony Neal is the author of several books and a Professor of Black Popular Culture in the Department of African and African American Studies at <?xml:namespace prefix = st1 ns = "urn:schemas-microsoft-com:office:smarttags" />Duke University. A frequent commentator for America’s National Public Radio, Neal also contributes to several on-line media outlets, including NewsOne.com, SeeingBlack.com and theLoop21.com.